There is no dearth of ideas in today’s world with companies like Kickstarter and Indiegogo being the a catalyst to their creators. We explore some of the coolest music related tech that is almost funded and ready to ship out in the next 6 months. A lot of these devices can be life changing for most of us, and some are just pure pleasure and indulgence. Explore some of these ground breaking and functional inventions with us. What if you could adjust the volume of life itself? Turn down or turn up. Anytime, anywhere. No more flights filled with crying babies. No more risk of your ears falling off at that concert. No more loud neighbors. Only the sounds you like to hear, when you want to hear them. Sounds good? Well, hear us out. Double pun. Super intended. We are talking about Knops; the volume button for your ears. This acoustic hearing solution will give you full control over the surrounding sounds you hear. All day every day. The only all-in-one charger and USB hub for new MacBook and MacBook Pro. Charge. Sync. Grab and go. This is the ultimate all-in-one MacBook charger you’ve been waiting for. Charge your MacBook and up to 3 other devices all in one place. Connect and sync USB devices with new USB-C MacBooks. Ditch all the other chargers and dongles and save bag space. PowerUp is the only device that does it all! Get one now for the same price as a standard Apple MacBook charger. With Micro, you get the functionality of a universal travel adapter built into a cool design that matches the awesomeness of the gadgets you travel with. An adapter that’s simple, yet versatile and that feels extremely familiar, as if you’ve already used it and loved it all your life. AirLink adds Bluetooth connectivity to any audio device with 24bit Hi-Fi sound. It simplifies volume control, calls answering, virtual assistant control and picture taking. You can also sync and share the audio with your friends. Step into the future with ambient lights, a built-in smoke machine, and wireless charging. Kalium Sound Heroes are the most futuristic Bluetooth speakers that have ever existed. Every angle of our speaker is polished manually giving it a polygonal design complemented with sharp edges. It’s also a wireless charging dock for your phone, a wi-fi range extender, and a subwoofer. LOVE is the first high-end, smartphone controlled record player that you can use with or without its app. It redefines & simplifies the way music lovers interact with vinyl through smartphone control. LOVE turns counterclockwise on a still record. It can be controlled by a smartphone to play records, skip and repeat tracks, alter the volume, and even select different RPM speeds. It is Bluetooth and Wi-Fi compatible. MIDI Chord Generator, Arpeggiator & Step Sequencer and Studio Production Assistant. KordBot is a music production assistant that combines a chord generator, arpeggiator and step sequencer In one unit. KordBot enables users to quickly and easily play 1000s of chords on any polyphonic MIDI capable device. It has 32 built-in chord types including inversions for each, with another eight user-banks for storing custom chord types. Speaking of which, the ribbon controller is also both pressure and location sensitive, allowing 2 axis control of sound parameters during user-configurable MIDI Continuous Controller commands (MIDI CC). This means 2 separate real-time MIDI CC parameters can be manipulated at once, such as pitch bend and vibrato levels. A fully self-contained electronic percussion instrument in the form of a traditional handpan. The Lumen is an electronic percussion instrument in the form of a handpan, which provides the unique playing experience of it’s acoustic inspiration, with the added benefits that electronics bring. It features built-in amplified speakers, an advanced on-board audio processor and full velocity sensitivity. We want artists around the world to be able to pick up the instrument, turn it on and play – no need to connect to any other equipment. Being an electronic instrument, you can of course output the audio signal or MIDI messages straight from the Lumen. Never played an instrument? Not a problem! Today’s music apps make it easy to get started. The automat toolkit is a plug & play MIDI-controller and accessories kit that allows anyone to build awesome music machines using the real world as their instrument. 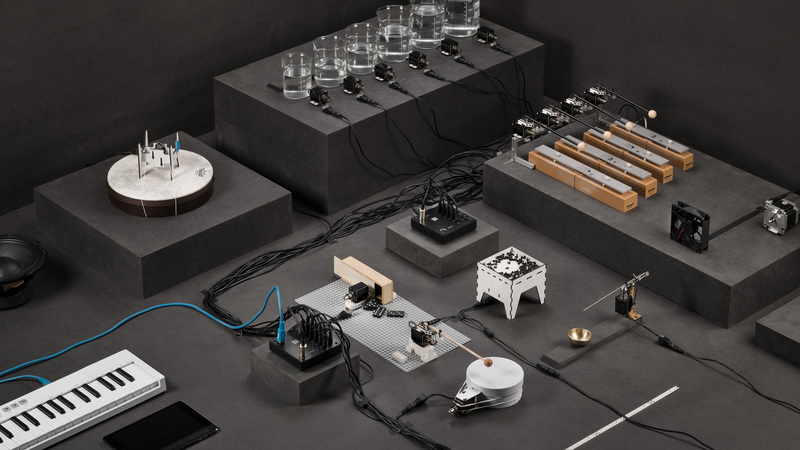 Automat is an innovative, hackable controller that turns MIDI signals into mechanical impulses and can be used to make musical instruments out of just about anything. Send text messages, voice recordings, images, and GPS locations on your phone without cellular coverage, satellite, or Internet access. Sonnet brings the long-range wireless communication of the walkie-talkie to the smartphone. It connects to your smartphone via Wi-Fi, and it will relay any data sent from your phone to other Sonnet devices via the long-range radio wave. This completely removes your smartphones’ dependency on cellular grid and other network infrastructure, and allows it to be used even when you have no cellular connectivity or internet access. Alpha Glass are on-lens display AR glasses with wide field of view and casual design. Unlike other AR glasses with external elements, Alpha Glass have internal optical system inside the frame. Built-in high-performance bone conduction speaker allows you to listen to music and receive voice guidance.